You can’t ignore the smell of burning plastic. Neither can you ignore the sight of young kids and women sleeping on a dumpsite, surrounded by acres full of trash, hundreds of vultures and some cattle grazing on disposed products. Still, at Kachok dumpsite in Kisumu, this is what everyday life looks like for many people. “Sometimes you can even cry”, John Ochieng - the dumpsite manager - tells me. And in fact I could cry after John takes me for a little tour around the site. Fortunately, grassroots organisations are bubbling up in Kisumu as well. Kibuye Market Waste Management CBO is a grassroots traders’ co-operation that reduces the pressure on Kachok dumpsite by recycling the market waste into valuable and profitable products. A huge and logical urban challenge for growing cities is waste. A growing city means more waste in less space, but also better opportunities to manage it. In Kisumu they are visibly struggling. Rapid population growth and uncontrolled industrial development has degraded Kisumu’s urban environment. The city generates an average of 385 tons of waste per day and only 25% is effectively collected. The rest ends up in backstreets, markets and alongside the roads. Whatever reaches Kachock dumpsite is being sorted with bear hands by scavengers; street kids who eat sleep and live at the dump site. Surrounded by schools, a football stadium and a big mall, this fast growing dumpsite should move towards a facility with new technologies and good management asap, but who wants a Kachok in their backyard? That’s one of the problems, Mr. Harun Gullah of the Kisumu County department of Environment explains. More challenges arise due to a low capacity to offer waste services and a poor attitude towards waste disposal among the city residents. Waste is still not viewed as a resource, while 60-65% is organic in character, presenting enormous recycling potential for farm use. Instead of moving forward, places like Kachok have entered a complete standstill. Not the waste of course; the piles grow higher every day. 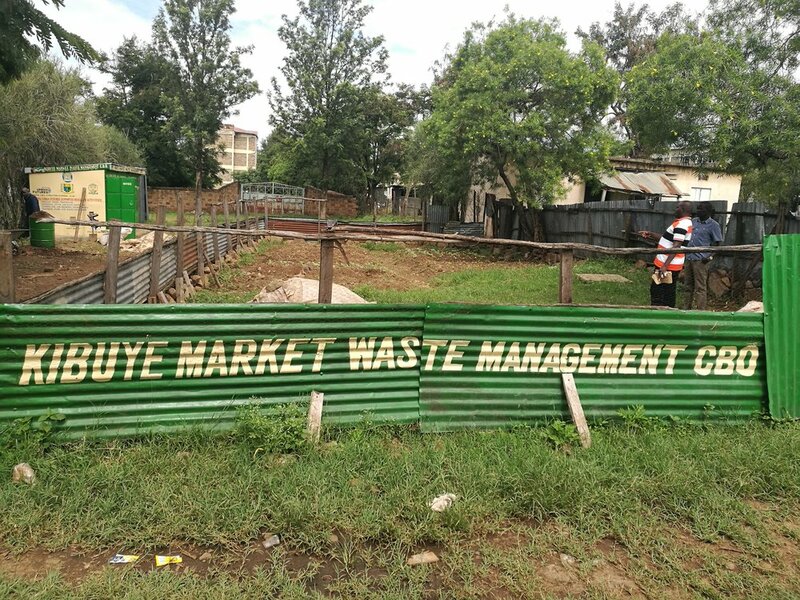 Although the waste comes from all over the county, a massive supplier and pollutant is Kisumu’s Kibuye market: the biggest open air market in east and central Africa, serving the entire western region’s grocery needs. Among the thousands of stands and traders, you can find anything you want here. Although American looking malls are multiplying in Kisumu, Kibuye and other local markets still play a huge role and remain most popular among ordinary people. The value of recycling has already been recognised by market entrepreneurs and traders for quite some time. There are different sites where plastics and metals are recycled and reused. If you see what they can make simply from used petrol vessels, you’ll be really amazed! However, the majority of the generated waste is organic. It’s just being thrown on the ground until it dissolves. Due to the resulting hygiene issues, especially during rain season, a group of entrepreneurs decided not to wait for change at the county level. They began to collect and manage the market waste their selves. Three years later this grassroots traders’ co-operation sells its own organic waste with profit. Under the flag of Kibuye Market Waste Management CBO, they make the market cleaner, present an alternative to chemical fertilisers and reduce the pressure on Kachok dumpsite. In many ways, they turn waste into useful and valuable products. As I enter the office of CBO - provided by the county government and strategically located next to the market – a group of people gather around what looks like a vessel covered in dust. It’s actually a 'carbonization experiment', one of the members explains. Saw dust (or: wood dust) is pressured and excluded from oxygen for a period of 8-10 hours, after which it becomes organic charcoal. The group is trying out different waste materials for energy recovery; vegetables can for example be transformed into fossil fuel. Next to the carbonization process, the organisation also composts organic waste into manure. Piles are covered to keep it moist and hot which accelerates the process. After three weeks the compost is ready to be dried before it's ground into manure. This organic manure - which is been tested and certified - is then sold to local farmers. The simplicity of the processes is an important factor to the success of the group. Ironically, this also seems a huge obstacle for the group's future existence. Isn't it true that if more people find out their waste is profitable and easy to recycle, they might rather collect and process it their selves? The financial organisation accounts for this, one of the members explains. Profits and member contributions form a fund. From this fund, the members can apply loans for different projects. This way, the members benefit from the communal effort of the group more than if people were all selling their own manure. The work of Kibuye Market Waste Management CBO is truly inspiring. Although it’s not going to change the sad picture of Kachok anytime soon, it reveals the impact of grassroots and communal effort. Together, people can solve common problems more efficiently in a way that benefits the people themselves.